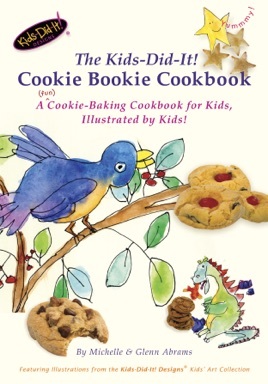 A (fun) Cookie-Baking Cookbook for Kids, Illustrated by Kids! This deliciously fun introduction to baking features easy-to-follow and fun-to look-at cookie recipes, each illustrated with delightful watercolors from the Kids-Did-It! Designs® kids' art collection. Just imagine Chocolate Chipmunks, Dragon Crisps, Peanut Butterflies, Moon Melts or Peppermint Pig Puffs. Tasty dessert recipes, deliciously illustrated! This iPad edition is kid-friendly, colorful and creative, with delightful illustrations, yummy step-by-step recipes using everyday ingredients and instructive graphics that help make the recipes easy to understand. "This playful cookbook appeals to anyone looking for something fun to do with kids," says author, art teacher and baker, Michelle Abrams. "Even better, the recipes are easy and delicious, and each young illustrator earns a royalty - plus, it makes a great gift! "My personal favorites are the MoonMelts! Picture delicious, gooey marshmallow cream stuffed between two cocoa cookies floating in a colorful field of planets and stars!" Great activity book, GREAT art!!! This book is creativity to the max! I received this cookie bookie as a gift and have been raving about it ever since. Not only are the recipes fun, creative, (YUMMY!) and kid friendly, the illustrations throughout the book were created by children! It is amazing the quality of art these children have produced, and I find myself thumbing through it repeatedly enjoying the vibrant color and cute designs the kids have come up with. I plan to buy several more and attach them to baked cookie bookie goodies for Christmas presents this year for my friends with little ones. This will continue to be a great project for our rainy Northwest winters for years to come! Can you tell? Highly recommend this book. Vibrant with color and so fun!! This is an awesome and colorful cookbook for adults and children. The children's drawings are wonderfully bright and animated; the recipes easy to understand and follow. I recommend it to all who love baking, are looking for tasty cookie recipes, who would like a fun activity to share with a child or grandchild, or are looking for a gift idea for a fellow parent, teacher, grandma, grandpa, sister, aunt, neighbor, etc. Love the double-tap zoom to see details on the iPad. The vertical orientation makes for easy reading. Makes for very happy baking! Not only did this cookbook look beautiful, the recipes made some delicious cookies! I love the moon melts and the chocolate chipmunks. I'm blown away that kids did all the art too. I think this is a great book and a great gift. It is so creative and fun. Thanks for all the great recipes!